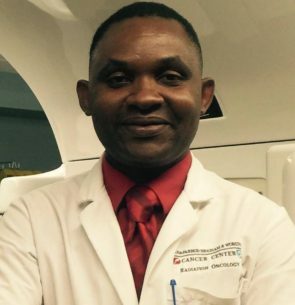 Wilfred Ngwa is the Director of the Global Health Catalyst program at Dana Farber/Harvard Cancer Center and a professor of radiation oncology and faculty medical physicist at Harvard Medical School and the University of Massachusetts. He also currently holds an international guest professorship at the University of Heidelberg, Germany. He has published a number of books including “From Dust to Snow: The African Dream” which chronicles the experience of Africans in North America and Europe (the good, the bad, and the ugly) and how the African Diaspora can work together to give back to their sending continent. He has won a number of awards and prizes, including the 2015 BRIght Futures Prize for innovative new technology (Tiny Drones to Target Cancer) designed to train the immune system during radiotherapy to kill cancer cells that have spread to other parts of the body with minimal side effects or collateral damage. Wil is also the Co-founder of African Renaissance Ambassador Corp, Non-profit Organization in Florida with major activities in Africa focused on: Empowering women, youth and addressing health disparities. Wil earned a Bachelors degree at the University of Buea Cameroon, and graduate degrees at the University of Leipzig Germany, and subsequently postdoctoral training at Harvard Medical School. He has worked in Cameroon, Germany, USA. Wil loves God, Family, working to address the growing burden of non-communicable diseases like cancer, diabetes, cardiovascular diseases, which are now the leading cause of death and disability in Africa. His Hobbies include: philanthropy, soccer, scrabble, super-hero movies and Mr. Bean. In Philanthropy, Wil chairs a number of committees on healthcare in the USA and Africa. He is widely published and is a sought-after public speaker and advisor on global and public health issues.